Because wooden chessmen are finished using a natural wax polishing method it's important to maintain the wax surface. Therefore do not use any solvent based cleaners or detergents to clean them, doing so may strip the wax from the wood and will ultimately result in dull chessmen that have lost all their sheen. Using thin wax based polishes may also cause the wax to degrade over time. The best advice is to simply wipe them with a clean dry and soft cloth and keep them away from dusty environments. The finishing of chess sets is another issue that we can go into great detail on. There are various ways of finishing chess pieces and boards, both are done very differently. The most common way to finish chess pieces is by polishing them up to a gloss using a hard wax compound. Assuming you have used a quality hardwood to make the chessmen they should take a good degree of motorised polishing very well. The typical method involves a fast spinning polishing wheel and a block of super hard wax, in fact in it’s natural state the wax is so hard it’s almost like glass. 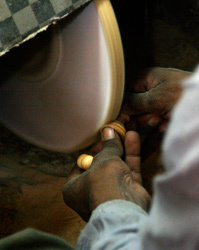 The wax is pushed against the spinning polishing wheel and the friction heats up both surfaces. Tiny amounts of the wax then melt and become attached to the fibres of the wheel. These then impregnate themselves into the wood grain of the piece and of course the wax re hardens as it cools. The result is a beautifully polished chess piece! Finishing chess boards can be done in a variety of ways. Indeed some boards are finished in the same way as chess pieces but generally speaking they tend to be lacquered. Veneer boards tend to be finished with a very thin coat of lacquer that is then left with a matt finish. Other boards utilise many coats of lacquer that are then polished up to a fine shine with polishing compound. 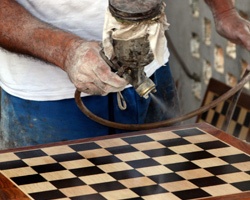 Old fashioned methods such as French Polishing and shellac are also used on very high end chess boards.